Tonight we set up the hall for our Miniatures show this weekend. I was working making things for my house right until the last minute. While I was cooking the dinner I made a little shelf for the laundry, I think the paint on it was still wet when I hung it up! 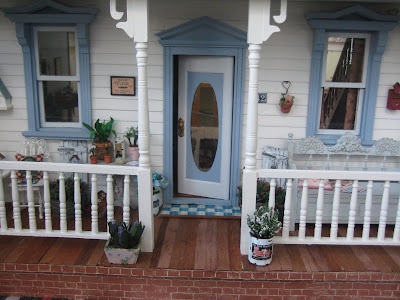 So here is a pic of the front of the house, I think the porch has become my favourite room, lol! 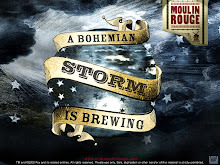 Hopefully you can click on the pics to make them larger. I don't have time to explain all the details tonight (It's getting late here), so ask me if you want to know about anything. 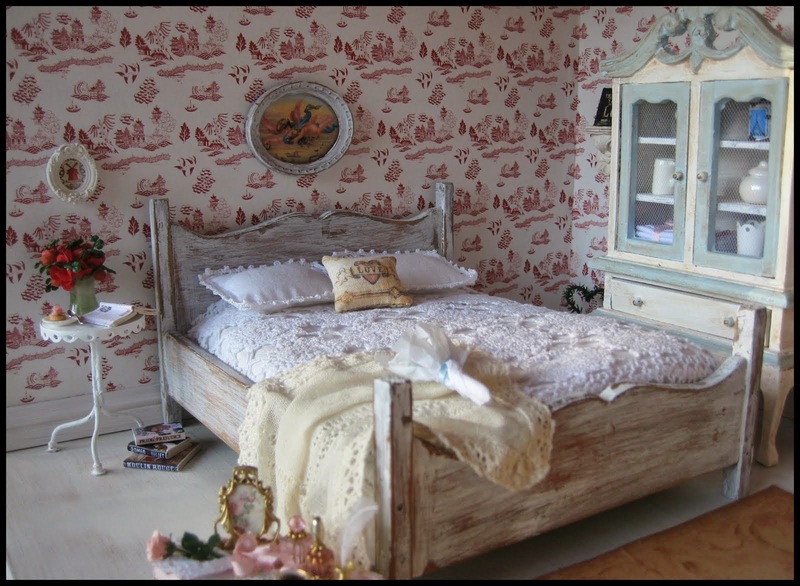 Next week, I'll start showing you around the rooms of the house. It's still a 'work in progress'! First let me say a big THANK YOU to all the lovely people who have passed awards on to me recently. I'll be back to collect them after my miniatures show which is next weekend. At the moment I'm working like a mad woman to get the house as ready as possible for the show. Which is one reason I have been making Sylvia's tulips like crazy! 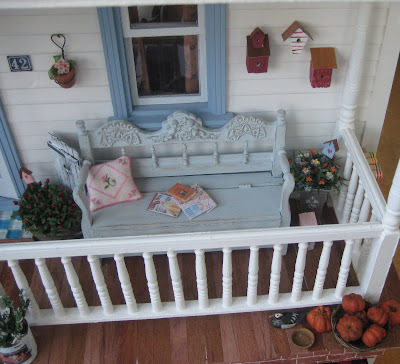 The actual dollhouse will be pretty much finished but the interior details will not! I have niether the time, the energy nor the money to get it 100% complete within a week. So my clever plan is to have as many flowers in the house as I can...perhaps people will notice all the loveliness and not the things that are missing...like the oven. LOL! 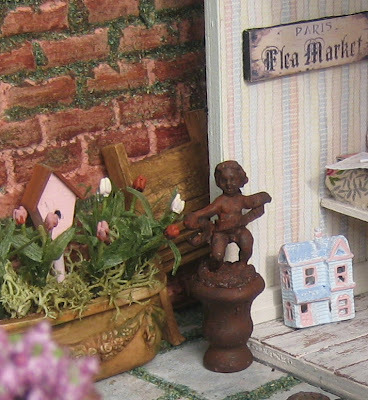 I LOVE Sylvia's flower shop and all the baskets of flowers she has everywhere so I decided to fill the big basket I made with tulips. I discovered it takes a LOT of those teensy tulips to fill a basket that size. 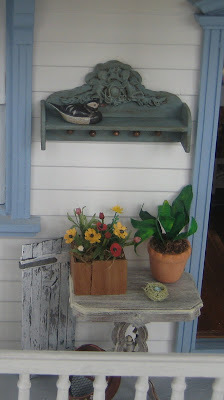 I'm thinking that maybe one day I'll have to make the porch of the house into a flower shop. Of course I will have to learn a few more flower making skills! I was trying to paint them while I was on the telephone (no, it wasn't easy) when Liberty came and took the paintbrush from me and had a go herself. I tried to tell her not to because it was very delicate work, however being only four years old she took absolutely no notice of me and proceeded to paint them very carefully. She actually did a far better job than I expected! Only she got bored pretty quickly. Pink and white tulips in the lounge. Sorry for the bad photography, everything is being done in a great rush these days. That bowlful of tulips actually looks much better in real life! 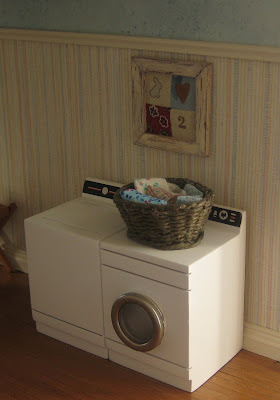 Oh and very late last night I made a laundry basket which I forgot to put handles on. I can probably still make them or maybe I'll just drape the washing over the edges. I only had two tulips left over from the pink batch so I threw some multicoloured flowers in with them for now. They are in the nursery. Of course no real mother in her right mind would leave a vase of flowers that low down in a childrens room. LOL! 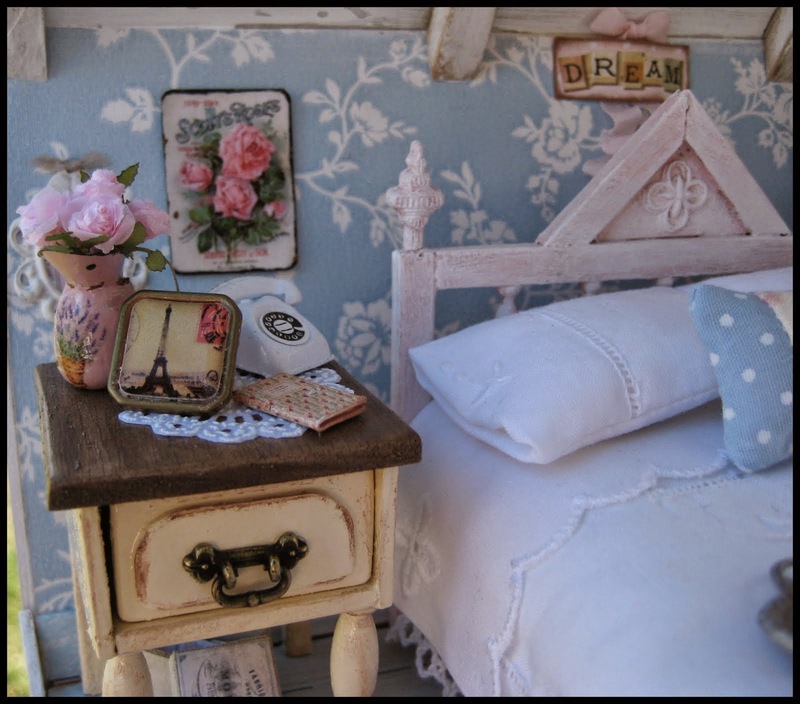 When I was in Melbourne last week I found the little statue of Liberty that you can see on the shelf above the bed there. It's a silver charm for a bracelet so it cost a ridiculous amount of money, it's less than an inch tall. There was a slightly larger more detailed one for three times the price, but this will do for now. Liberty was SO excited when I gave it to her, it was so funny. We didn't name her after the statue 'Liberty' was just a name we loved. But she calls it 'the statue of me'. And when she has an ice cream in a cone she'll hold it up high and say,"who do I look like?" 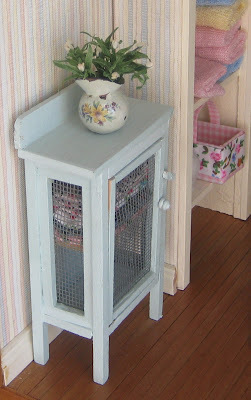 And finally I have made baskets for the drawers in the kitchen. All along I've wanted baskets in there and now I have the technology I have made them! Yippeeee! 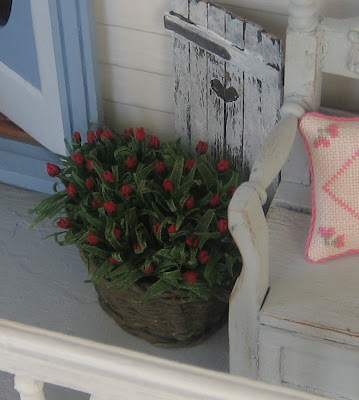 I've been asked what sort of string I used to make the baskets and it's actually 'hemp' string but in the tutorial (link is in the previous blog entry) she says she uses kitchen string. Today I found some coloured paperish string so I'm going to give that a try. And if you go to the site with the tutorial and want it in English you need to go to her home page and there's a translate button. 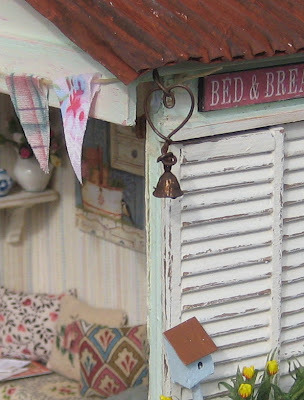 Once everything is organised in the dollhouse and ready for the show I'll take some proper pictures and show you all the rooms. Sorry to keep you waiting Sans! These 'teasers' will have to do for now! 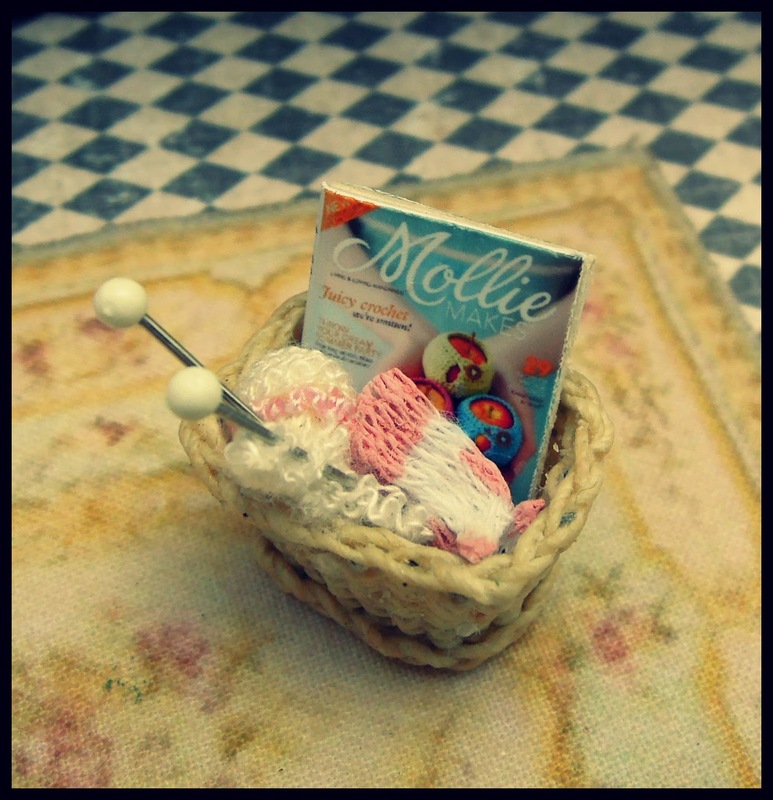 I love baskets and have long wanted to be able to make some for the dollhouse but didn't know where to start. 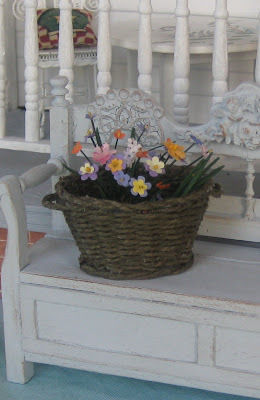 Sylvia had made beautiful baskets for her flower shop and she sent me this link so I could make some too. But, being Sylvia, she also sent me some basket making supplies! Last night I made my first basket and I cannot believe I did it, it turned out way better than I could have hoped! Now I have the technology I can finally make my kitchen drawers, I had given up all hope of being able to make baskets for my kitchen but now I can! 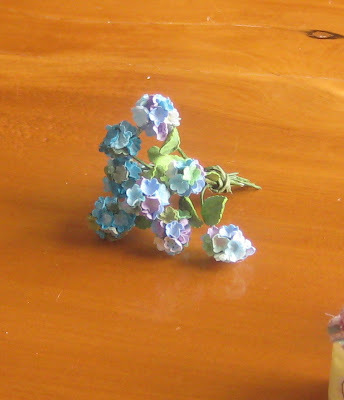 I made the flowers at my miniatures club some time ago, I need a lot more to fill the basket up. The little table the basket is on I found at the $2 shop yesterday. 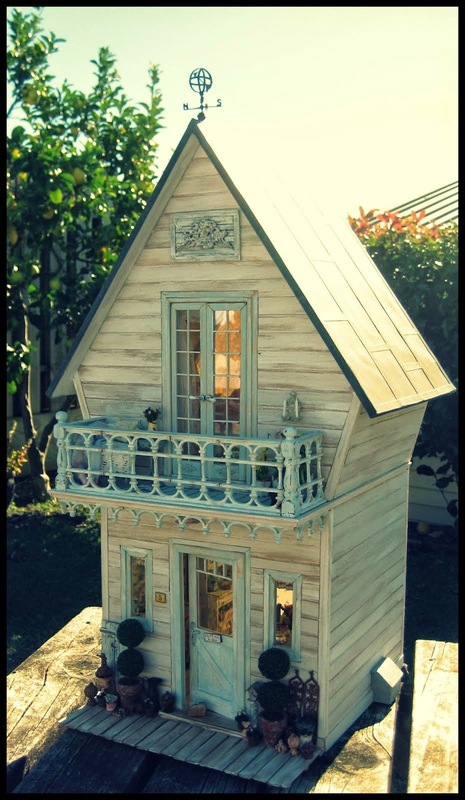 It was already painted with birdhouses, how perfect is that! 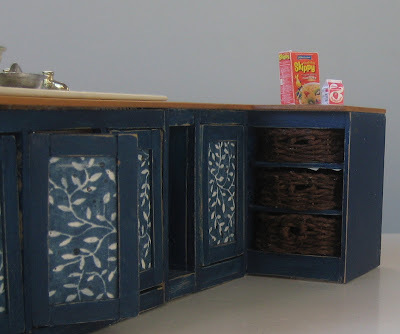 The $2 shop has had a range of furniture for a while but I've never seen any painted like that table, the packaging was dusty and looked really old - I think I just came along at the right time! Some things are just meant to be. 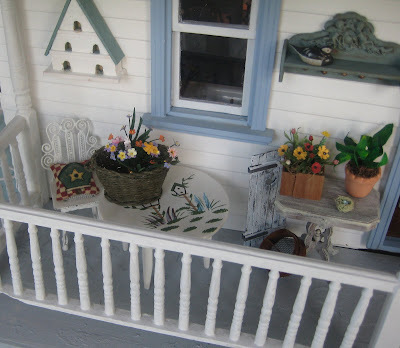 Dear Sylvia also sent me that gorgeous little shelf that I have on the porch there. It arrived on Monday morning so I put it there straight away. 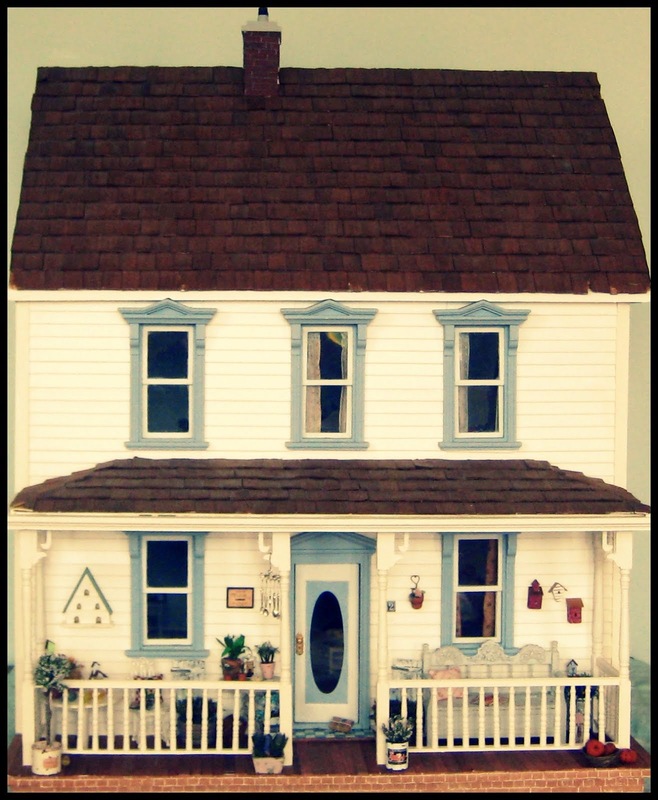 On Monday afternoon I had a reporter and photographer from our local newspaper come and interview me about our club's miniatures show which is to be held at the end of the month. 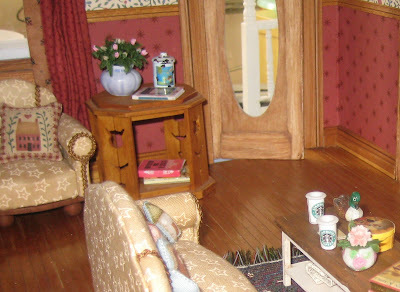 I had been working frantically all weekend to get the dollhouse as ready as I could for the photo shoot. 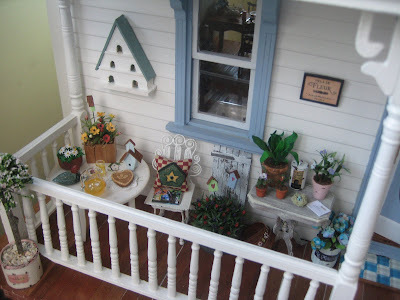 I have to say a huge 'thank you' to all my wonderful blogoshpere friends who have sent me so many beautiful things for the dollhouse, without your gifts it wouldn't look nearly so good, actually it would be looking pretty empty! 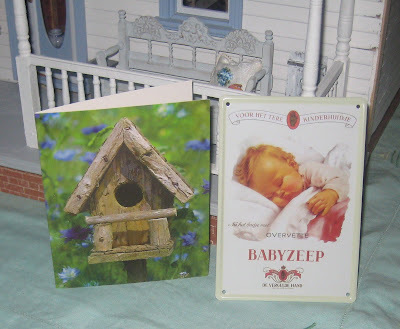 Also in Sylvia's package was the most gorgeous tin sign - a postcard size version of the mini one she made me! 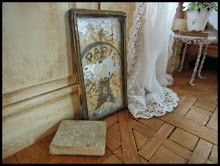 I LOVE that little tin sign! Dank je wel Sylvia! Sorry if I haven't been around visiting your blogs recently, it's all got a bit crazy here with the show looming and hubby away. And on Friday I'm going to Melbourne for a few days, hubby is already there, he's working - so I'll be able to shop unhindered - bliss!! 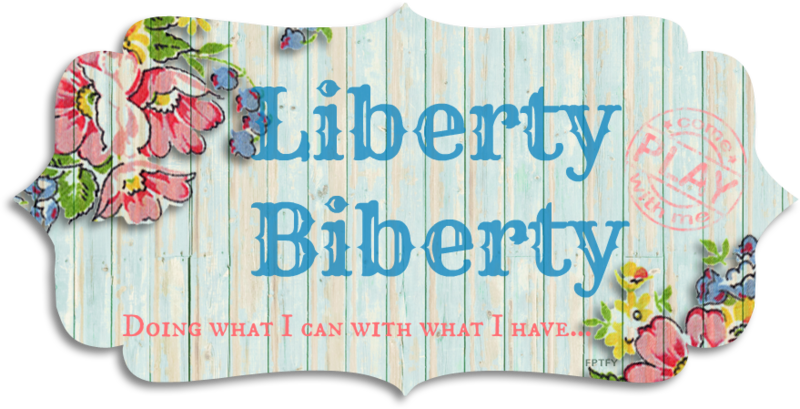 A few weeks ago I won a giveaway on Katie's blog. I was amazed that I had won because I truly never win anything. I once went to a fashion show (years ago when I had no children and could afford nice clothes) with four of my hubby's sisters and his mother. There were hundreds of people there and all through the evening they were giving away prizes by pulling a ticket number out of a hat. Everyone I was with won something, but not me! So really, I could not believe it when Katie said I had won! And it was just the best prize to win, a whole load of miniatures. 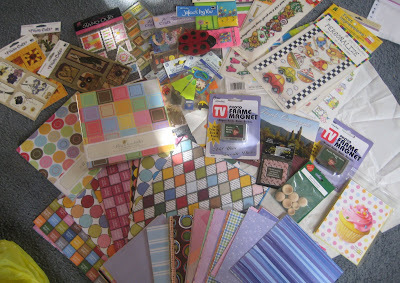 And she sent gifts for the kids and because she knows I'm also a scrapbooker she sent a huge lot of scrapbooking supplies. It looked like Christmas here when her box was opened. 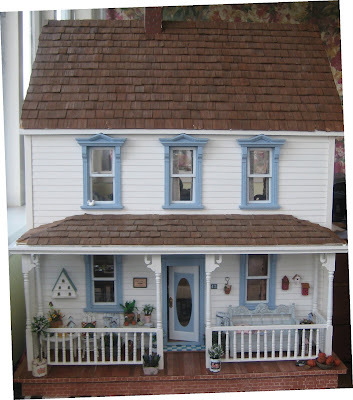 There were just so many wonderful things, look at those fridge magnets, they're flat screen tv's and just the perfect size for the dollhouse! And just look at all those gorgeous little bags! So much work has gone into all of those. There were all sorts of minis, my favourites are the books and journals with real pages!! 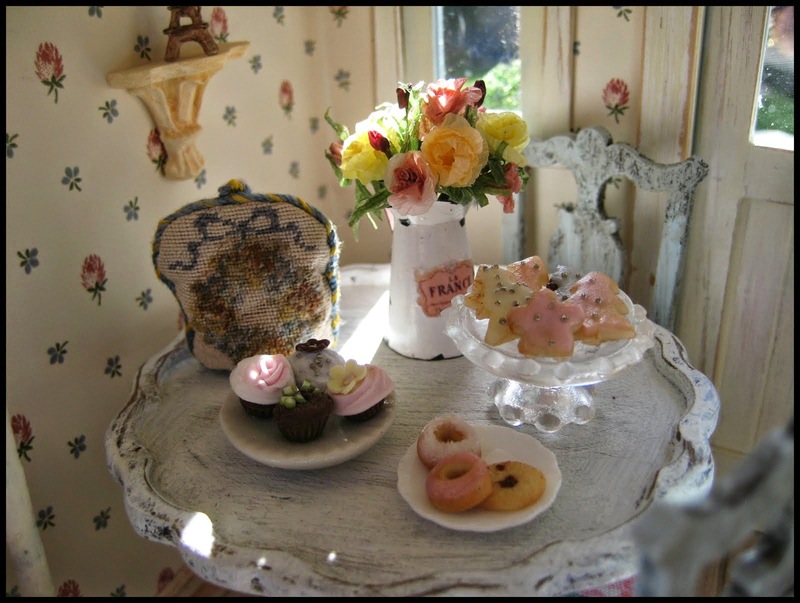 that Katie made, her framed picture of Mt Rushmore and the teensiest tea cup and teaspoon with a little cupcake. Liberty had a great time with her Care Bears paper doll books and all the stickers and the playing cards Katie sent her. 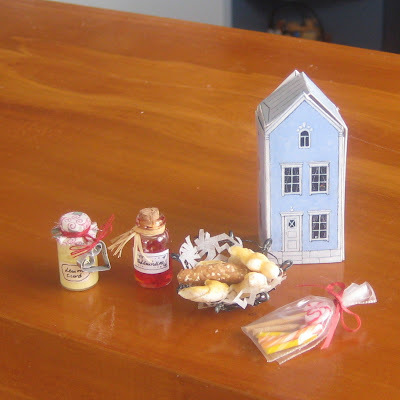 There were also special toys for Liberty's dollhouse and a little package of jewelery from Cora. 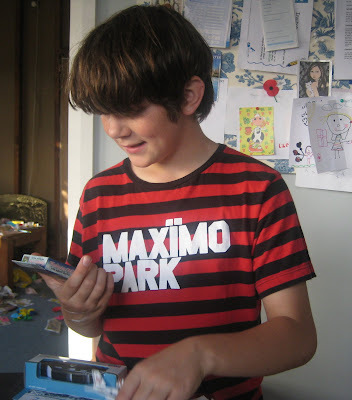 And gifts for Noah too! He was very happy! He was going to skulk off to his room to open them but I told him they had to be opened right in front of me so I could take pictures. LOL! The gifts Katie sent for the kids were very special. 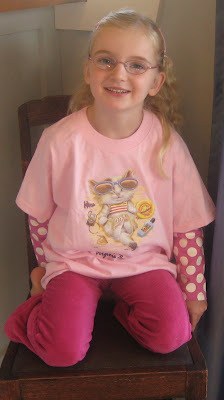 Katie added to Liberty's international t-shirt collection with this little number from Virginia Beach. Thank you so much Katie! Your package was just the best fun and everything was so beautifully wrapped. Christmas came early this year...and it was GREAT! 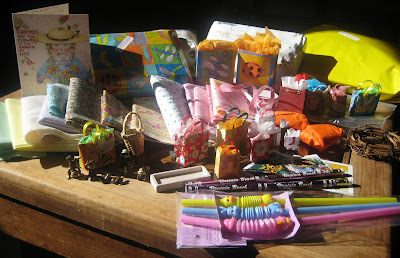 I have just done a swap with Hanna at Hanna & Leijona and yesterday my goodies from Finland arrived in the mail! It's so exciting getting treasures from all around the world! Hanna sent me the sweetest things - beautiful hydrangeas, mini candy sticks, a wire basket of breads, little jars for the kitchen, just look at that little metal heart hanging on the lemon curd jar, how cute is that?! 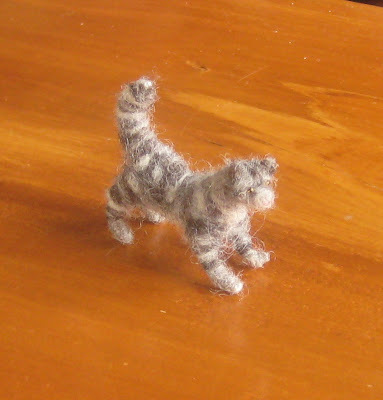 Hanna also felted this lovely little teddy. 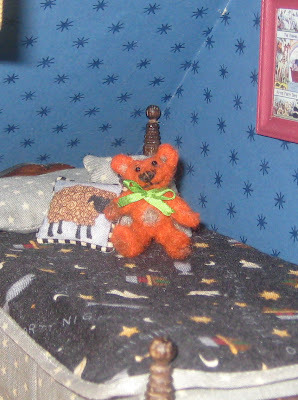 She thought that the teddy might be too bright but he is just perfect for the boys bedroom in the dollhouse, it's in the attic and I've used dark blue wallpaper and the bed cover has a black background so that little teddy just brightens up the room! 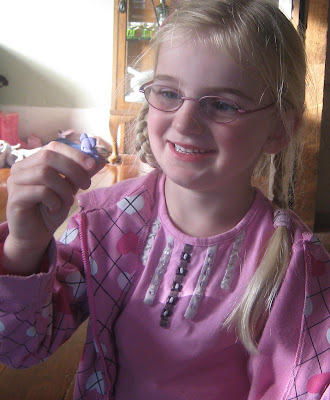 Along with Aava's drawing the teddy was Liberty's favourite thing! 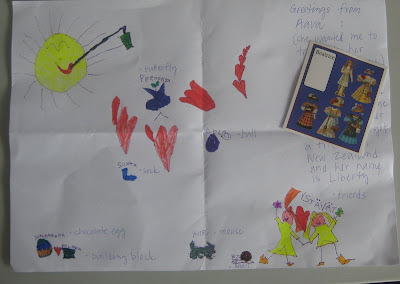 Hanna's sweet little daughter, Aava, sent a beautiful drawing for Liberty. So cute to see all those words written in Finnish! 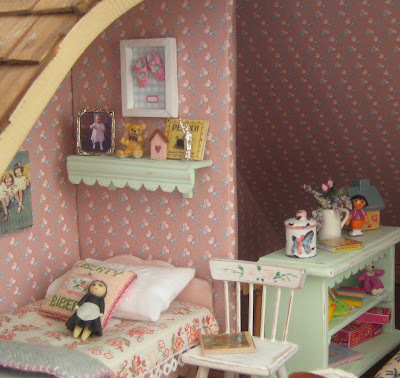 There was also a tiny paper doll for Liberty and a postcard that had a house on it to cut out and make up! How cool!! Swapping is great fun! Thanks Hanna and Aava! 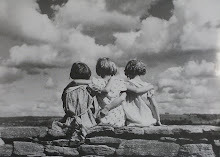 Yesterday I received some wonderful mail from dear Sylvia. 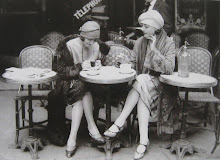 Before she went to Paris Sylvia told me she was going to send me some instructions to make a dollhouse oven. However, when the mail arrived there were no instructions but a card from Sylvia telling me she was going to buy me Lea Frisoni's book when she went to Paris!!! I had to read her card several times just to believe it! And here it is, in my home now, and I still cannot believe I have this beautiful book. 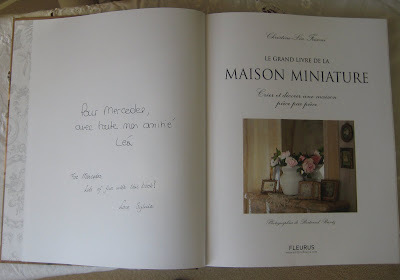 Sylvia even met Lea Frisoni and had her write a message to me in the book!!!! I have never seen a more wonderful book about miniatures, I am going to have soooooo much fun making things! And in case you are wondering, the book is all in French and I only know un petit peu French but there are plenty of diagrams and pictures to follow (I'm not much good at reading instructions in English anyway - too impatient!). 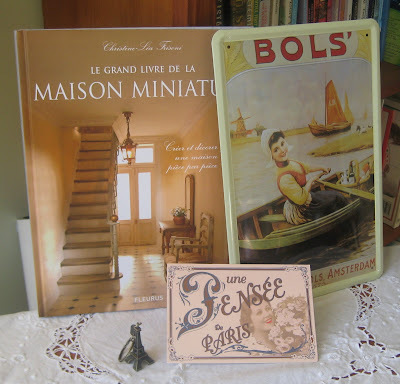 Sylvia also sent me that gorgeous dutch tin sign up there - now I have a little piece of The Netherlands in my home! 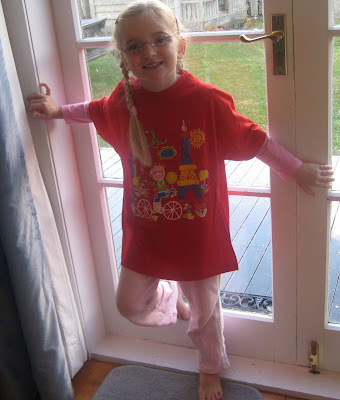 And for Liberty - an Eiffel Tower key ring and a lovely bright t-shirt, she was one happy little girl! Thanks for all the lovely comments on the garden! Today I'll show you how I made some of the things in the garden. 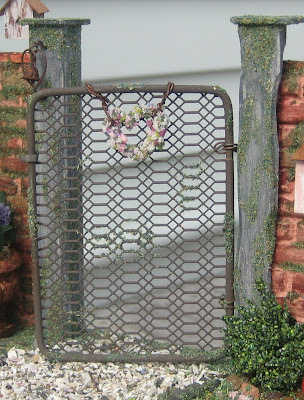 I'll start with the gate because so many people want to know how I made it. 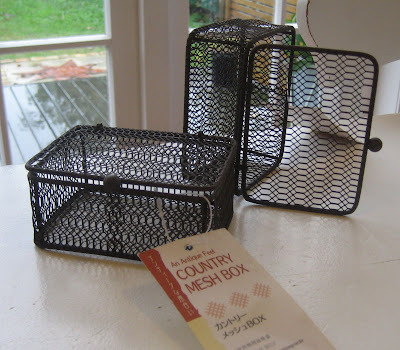 I didn't actually have to do much - it was a lid of one of these mesh boxes that I found at the Japan shop. I couldn't believe it when I got it home it was exactly the right size for the gap I had left in the fence! It was even 'rusty' already, I just glued a bit of fake grass (from a model train shop) here and there on it to look like moss. 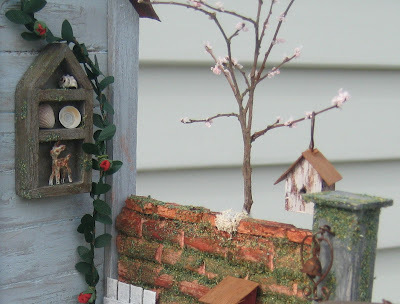 The gate posts are made from balsa wood as is the shadow box which was made by Katie. I painted them all in an old weathered wood style and added some fake grass for moss again. The pond - I started with one of these little 'things' I don't even know what it is really for, it may be something off the bottom of a chair leg. I just bought a couple of them one day in case they had some future use. 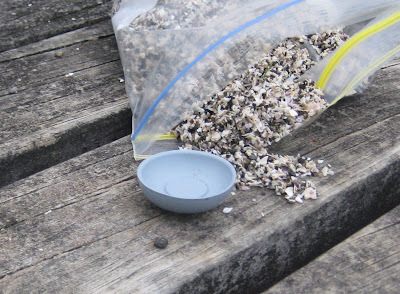 I glued shells I collected from a beach in it, I found a beach that had the tiniest crushed shells, it was easier than trying to crush them myself. The fish was silver and black when I bought it but it was too hard to see on the shells so I repainted it. Then I just cut some clear plastic off some packaging that was lying a round to cover the top with. I've put some tiny bits of the plants that are ' growing' around the pond on top and it looks like they're floating on the water. 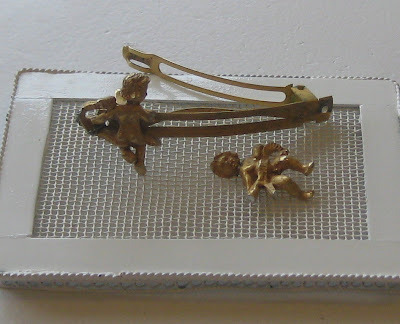 The statue was part of an old metal hairclip that broke some years ago but I couldn't bear to part with it (I bought it in Canada). The base is just a ceramic vase. I used Blu-Tack to stand the statue in the vase. I painted the whole thing rusty - I have discovered I LOVE painting things rusty! 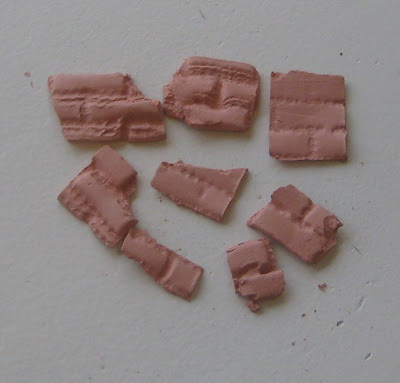 The brick wall is made from terracotta coloured Das modelling clay. 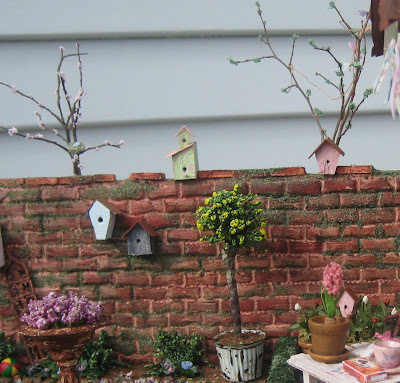 A lady at the miniatures club made a mould of the wall and we just pressed the clay into it. 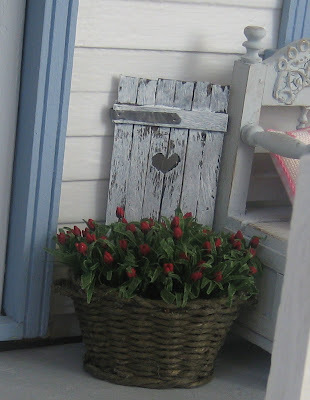 It dries quite a light colour so it needed painting, I threw a bit of fake grass on it too - I love using that stuff! It makes such a difference to the look of a piece. The tiny bells are actually called 'Liberty Bells' I bought them years ago. The rusty wire I twisted to make the hearts was in a scrapbooking bargain bin, it has been very useful. The trees are twigs from the same tree in the park where I found my Easter branch. I was wondering how I could add foliage to them without having to make ten thousand leaves. Then I remembered I bought this flower making stuff at our club once, I have no idea what it is called, I have tried making flowers with it but it's far too chunky. However, for spring foliage and blossom it is perfect! 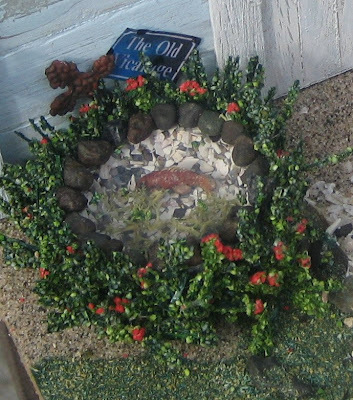 The box hedge is made from a piece of Oasis and sprinkled with the grass and some of the chunky flower stuff, it could have done with a bit more of the chunky dark green stuff but I only had a little bit of it and someone opened the door while I was making it and all my green stuff blew away! The topiary tree was made from the top of a larger tree that I bought at a model railway shop, I used hot glue to attach it to a real twig for a better looking trunk. All the dirt is dried tea leaves. So hopefully all that helps anyone else out there who wants to make a little garden. If there's anything else you want to know, just ask! Pretty little bags off around the world! Today I made some pretty little bags to send off to Finland. 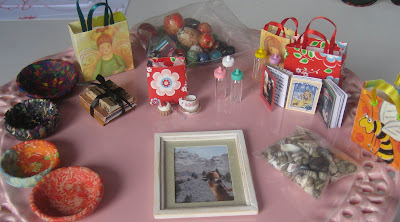 I am doing a swap with Hanna from Hanna & Leijona. 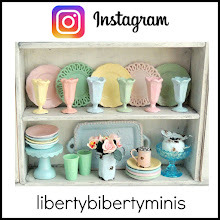 One of the best things about this swap, apart from the beautiful things that Hanna makes, is that Hanna has a creative little daughter called Aava and she is almost the same age as Liberty! 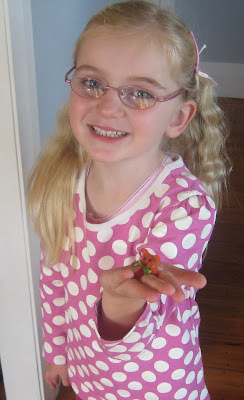 Liberty is so excited to have found a little friend on the other side of the world. 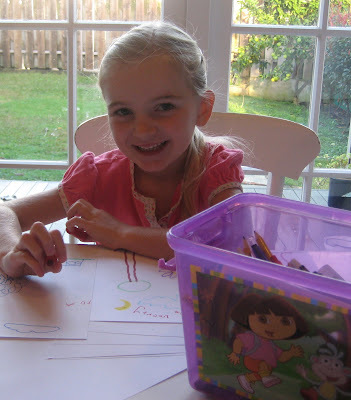 Here she is happy in her work drawing pictures for Aava. 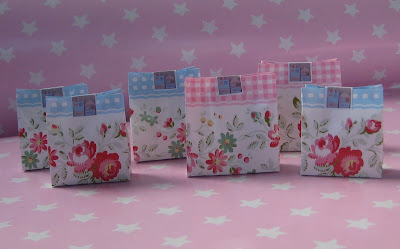 I made the little bags using tips from the wise Katie, you can find her 'how to' here. I found it extremely useful thanks Katie! Although I was much too lazy to attach handles so I just used stickers. Now I think I should spend an evening just making bags so I have a ready supply of them.